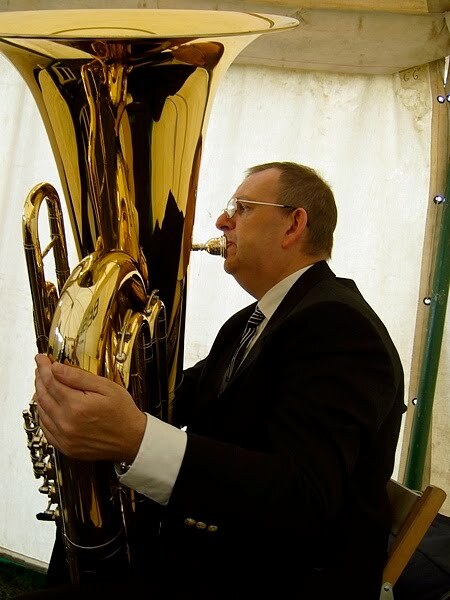 Yesterday morning, Saturday 24th July, the band played at St Mary's Church Andover for the wedding of our tuba player, Jonathan Hodgetts and his bride Mei. It's a big church, and the band fitted fairly easily into the south transept, where we were joined by two of Jonathan's tuba friends. We'd been uncertain just how long it would take for the couple to walk up the aisle, and had prepared for various contingencies when we played the Bridal Chorus from Lohengrin. 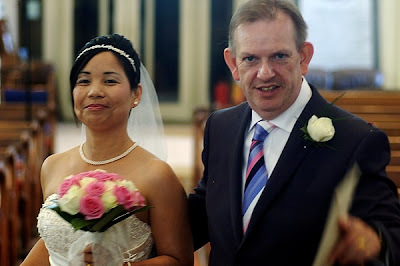 No worries though: bride and groom made a perfect and beaming progress to our bright and sonorous accompaniment! And doubtless they enjoyed the choice selections from Les Miserables, Phantom of the Opera, and Fiddler on the Roof we played before they processed. During the service the band accompanied the hymns, and to end we played Jonathan and Mei out of the church to Mendelssohn's famous Wedding March. Welcome Mei, and congratulations and best wishes to you both from everyone in the band!